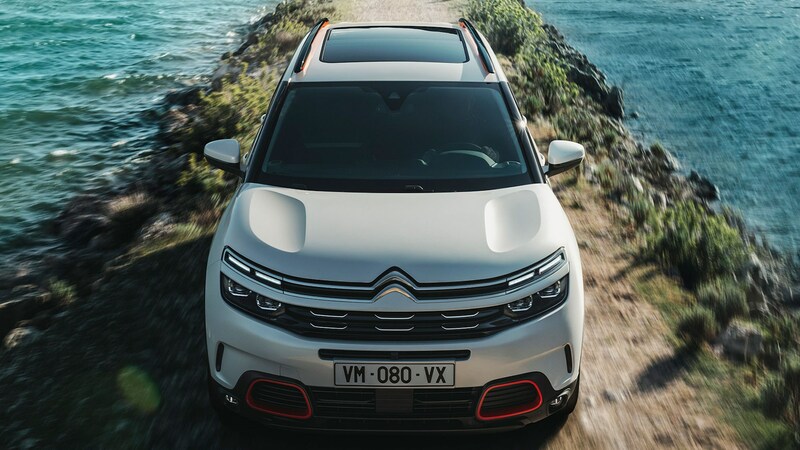 Citroen C5 Aircross SUV (2019) review: bringing new comfort to the masses? Your list of new SUVs and crossovers to consider next time you choose a new car just got a little longer. 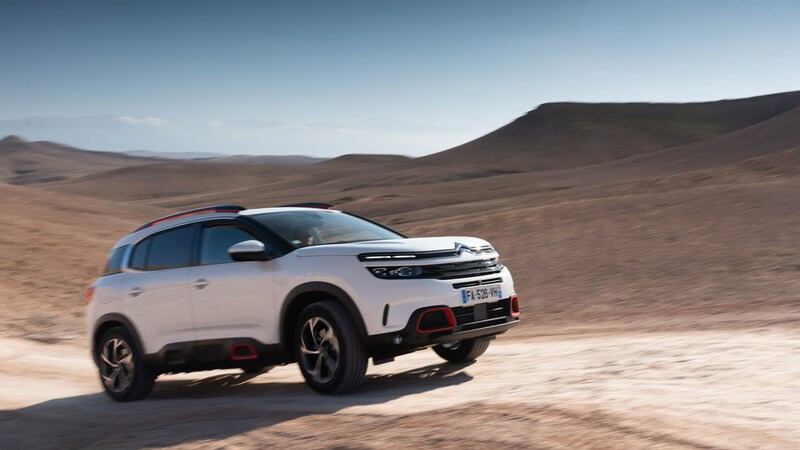 Although there’s something rather familiar about the general idea of the C5 Aircross, not least a name that straddles two horses in the Citroën stable, it is actually an entirely new car, albeit using plenty of hardware available elsewhere in the PSA family. It’s up against the Nissan Qashqai, Skoda Karoq and VW Tiguan, to name just a few. How can it compete against those proven winners? 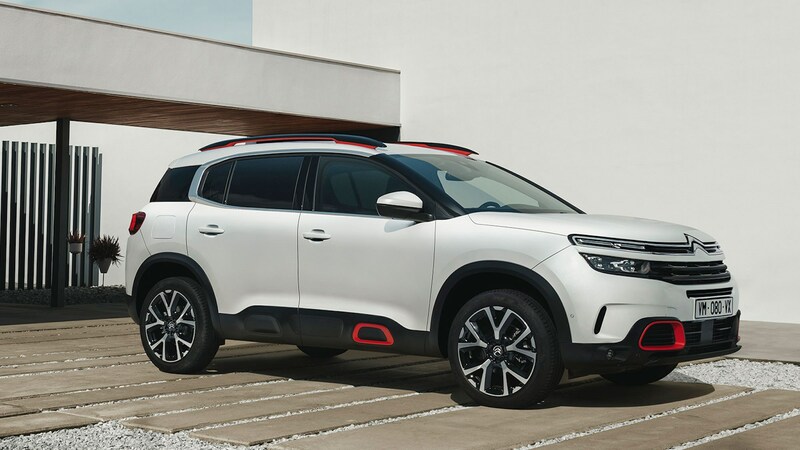 Citroën’s hope is that the C5 Aircross will be as practical and sensible as the now defunct C5 saloon and estate, while bringing an extra level of comfort and the cheery style and mild quirkiness of the smaller C3 Aircross (and let’s all try really hard to avoid confusing it with any of the Crossbacks from sister brand DS). On the face of it, this is a fairly generic front-wheel-drive crossover, not a million miles away from relatives such as the 3008, 5008 and DS 7. But it’s the details that give the C5 Aircross its unique identity. There’s no plasticky low-spec version, but there’s also no high-performance version. The aim is comfortable, smooth, calm, refined, mature transport for five. It’s very mainstream, aside from some mild styling quirks. There are four engines: the 1.2-litre petrol makes 129bhp and 170lb ft; the 1.6 petrol – which we drove – produces 178bhp and 184lb ft; the 1.5 diesel makes 129bhp and 221lb ft; and the 2.0 diesel peaks at 174bhp and 295lb ft. The smaller petrol is six-speed manual only, while the small diesel has the choice of six-speed manual or eight-speed auto. The larger petrol and diesel are both auto only. All are front-wheel drive, but there’s the option of PSA’s familiar Grip Control system. This is a multi-switchable traction control system, which offers Mud, Snow and Sand modes as well as our old chum Normal. Our off-road excursion, which involved some steep inclines and lose surfaces, revealed that they do make a difference. There are also two driving modes for general on-road use, Eco and Sport, both of which feel like they’re trying to make the car do something it would prefer not to do. Better to just leave it in its regular setting most of the time, and not even bother with the paddleshifters; the automatic makes excellent smooth changes, and rarely leaves you feeling like you’re in the wrong gear. 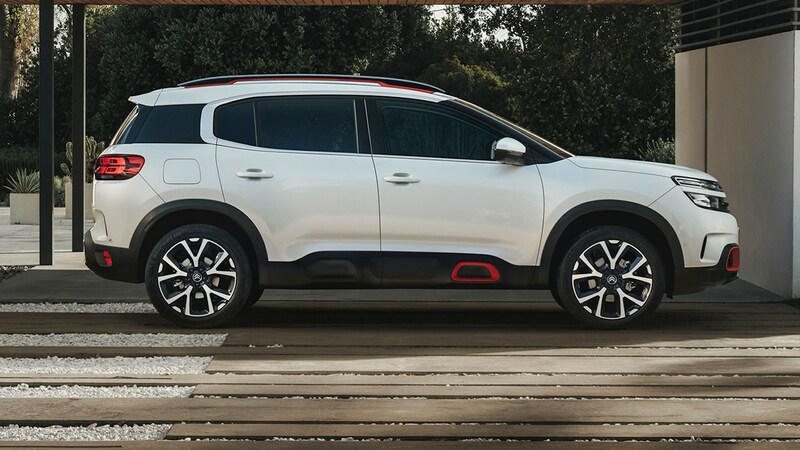 The C5 Aircross comes as standard with Citroën’s Progressive Hydraulic Cushions suspension system, which uses two bump stops per suspension unit. They adapt quickly to cope with changes from big dips and bumps to small imperfections. On smooth roads the hydraulic stops are minimised. On rougher surfaces, they inflate to absorb any jolts at either end of the suspension travel. But – in keeping with the overall wafty vibe – it’s not set up for Germanic hard cornering. Try to hurry through a sequence of bends and you create bodyroll that’s not much fun for anyone. The figures tell the story: the swiftest version, our 1.6 petrol, covers zero to 62mph in a non-thrilling 8.2 seconds, while the 1.5 diesel requires 11.8 seconds. That’s just not what this car is about. Dynamically it’s all highly competent if hardly remarkable. The real focus of the C5 Aircross is not under the hood or behind the wheels, but in the cabin. What’s so special about the cabin? Unlike the frilly DS 7, or indeed Peugeot’s slightly over-ornamented 3008/5008, the C5 Aircross is rather subtle and grown-up inside. There aren’t too many flourishes or flamboyant angles, nothing that’s there for no reason – just the necessary, done very nicely. The seating is a huge part of what works about the C5 Aircross. 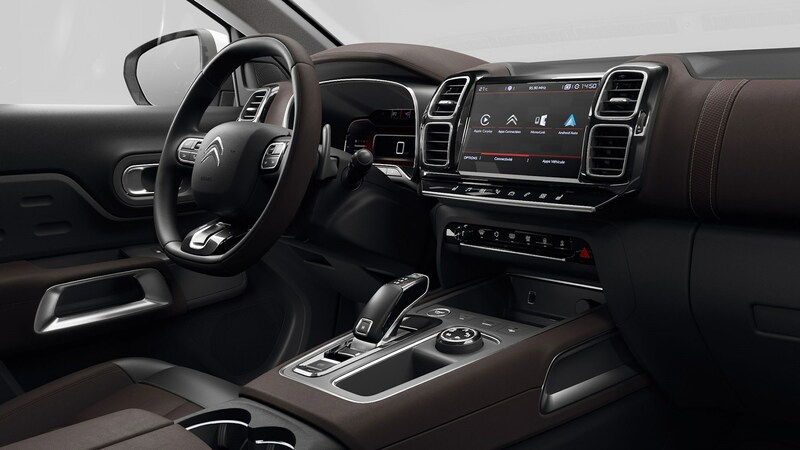 Up front, most versions get Citroën’s Advanced Comfort seats, which are supremely well shaped and cushioned, with plenty of adjustment. We did hundreds of miles in difficult conditions for a day and a half, and could happily have carried on. And that’s without the optional massage function. In the back, there are three seats, all adult size (although not as big as those up front), and they can be moved forward and back or folded individually. This not only allows the rear passengers to sort out the most conversation-friendly configuration, it also maximises your luggage-carrying possibilities. With the rear seats in use you get at least 580 litres, and up to 720. With them folded flat you get 1630 litres. That said, it’s not so well equipped in the back: the rear passengers get vents but not heater controls, just the one USB slot, and door bins that are a decent size but not a great shape for cups or bottles. There’s thick glass to keep the cabin quiet and some pretty heavy-duty air filtration to keep the dust and smog out. Called AQS (for Air Quality System) it detects, filters and purifies polluted air. A sliding panoramic roof comes with top spec or is a £990 option. It adds to the brightness of the interior but it eats into the rear headroom, making the difference between six-footers being comfortable and slightly hunched. How many choices do I have to make? For the UK market there are three spec levels. Feel comes with 17in wheels, 12.3in digital instrumentation and an 8in touchscreen, plus a decent sprinkling of safety equipment, and some agreeable grey cloth upholstery. Feel is only available with the lesser-powered petrol and diesel engines. Flair adds 18in wheels, front parking sensors, a reversing camera, the Advanced Comfort seats as standard, a sat-nav upgrade, tinted glass and leather and cloth upholstery. Flair Plus brings smarter headlights, adaptable cruise control, the opening glass roof, 19in wheels, some external trim changes and, inside, brown leather. Plus of course there are various options, available as packs or individually, mostly cosmetic or electronic. There are as many as 20 different safety and driver aid systems (either standard or optional), from modest features such as Hill Start Assistant (to stop you rolling back for a couple of seconds after you take your foot off the brake) to Highway Driving Assistant. This is a form of Level 2 self driving, in that it can (in certain conditions) speed up and slow down for you, and help you stay in your lane, although you need to keep your hands on the wheel and your wits about you, as it will return full control to you the moment the road markings become less than crystal clear. By Citroën’s count there are 30 exterior colour combinations possible, based on seven body colour, the option of a contrasting black roof with four of them, and optional coloured inserts in the front bumper, the Airbump under the front door (giving the illusion of an HGV-style foothold) and relatively subtle optional inserts under the (standard) roof bars. This works, if what you want is a car that’s as much about the passengers as it is about the driver; if you want a car that looks a little bit different from the norm, but which provides all the practicality and convenience of the familiar Japanese and German (or Spanish, or Czech) contenders; and if you share Citroën’s enthusiasm for a cosy, quiet environment over something more overtly dynamic and sporty. We’ve only driven one version, but we’ve driven it on road and off, through cities and on smooth dual carriageways. It offers genuine all-day comfort and copes well with everything.